STS Technical Services is hiring Material Review Board Liaison Engineers – Interiors in Melbourne, Florida. 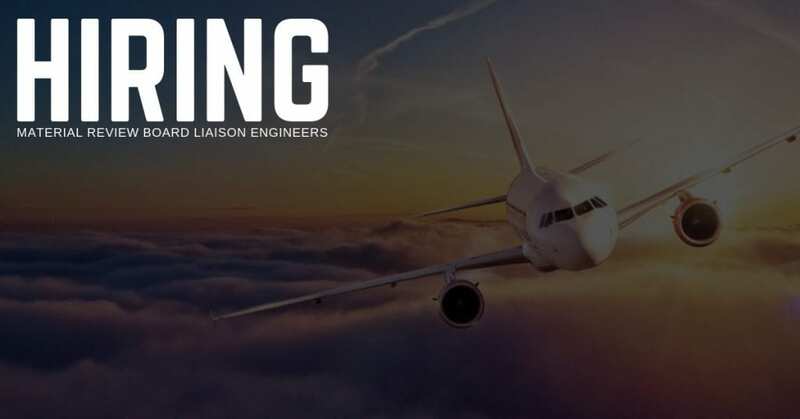 Provide product engineering support for production assembly line and production flights as related to aircraft interior assembly and engineering. Functional analysis for product non-conformities based on design criteria and certification reports of aircraft interior issues. Assigns responsibility for technical dispositions of non-conformities for the above systems on production line. Evaluate Technical dispositions impact on production schedules, safety, quality aspects, documentation and costs/benefits involved. Direct interface with other internal/external engineering areas involved on non-conformity analysis. Substantiate the approval of non-conformities considered “major” and present it for the local authorities as required. Validate supplier’s dispositions for non-conformities in case such supplier is not delegated as MRB. Start a design revision process with engineering staff for those cases which the disposition will affect interchangeability or maintainability of the product. Provide engineering support for trouble shootings on production line and production flights. Participate on production flights for engineering analysis. Bachelor of Science in an Engineering discipline required (Mechanical, Civil, Aerospace, or Aeronautical). Consultant Level Individual Contributor on a functional group. Generally 8-10 years of experience in a specialized functional discipline in an aerospace engineering related field. 2-3 years of recent experience in aircraft industries, design industries preferred. Interior design and certification experience preferred. Aircraft operation/maintenance (MCC) or production line experience desired (professional levels). Extensive knowledge in a specialty area and in all other interrelated tasks and responsibilities of the job function. Role takes leadership for applying new processes and skills to improve the function’s status quo. Ability to analyze and interpret company products (e.g., analyzing and troubleshooting aircraft systems problems). Understands governing regulations and compliance requirements. Ability to assess and document test or analysis data to show compliance. Able to apply a complete understanding of computer aided design tools and systems (e.g. Computer aided design/computer aided manufacturing (CAD/CAM); computer aided three dimensional interactive (CATIA), Mentor Graphics, Unigraphics. Skills to build and manipulate data sets, (e.g., compare CATIA to measurement data). Knowledge of design concepts and techniques (e.g., concurrent engineering, Design for Manufacture/Assembly). Knowledge of responsibilities and tasks performed by various Engineering departments/disciplines (e.g., design, test, software, technology, avionics). Complete knowledge of the interaction between departments/ disciplines and how their products/processes affect one another and impact non-engineering processes (e.g., Operations, Logistics, Business). Understands basic concepts related to statistic and planning (Target Program management), people management (HR guidelines, tools & policies). Comprehends value based management fundamentals (Shareholder Satisfaction x Customer Satisfaction x Employee Satisfaction), employment law (sexual harassment, disability, discrimination, labor laws, etc. ).